Network Cable Wiring tutorial for home and office networks. Since we are setting up a wired home network, the network cable wiring for your LAN must be in place in order to have your computers and other network devices communicate with your router. The network cable wiring in your home will consist of CAT5(100Mbps), CAT5e(1Gbps) or CAT6(1Gbps) Ethernet cable. Just remember the speed of your network will be the speed of the slowest device on your network. In other words, if you use a Gigabit switch and your computer's Ethernet adapter supports only 10/100Mbps,then your network will run at 100Mbps. If you want the Gigabit speed then all your devices must support it. Start by connecting your ISP cable into the Cable modem. Connect an Ethernet patch cable from the Cable modem's only Ethernet port to the router's WAN port. Connect all your computers and other network devices like printers and laptops to any of the 4 LAN ports. Note: If you use a router with LAN ports then you have to configure "Bridge mode" in the routers interface only if you connect a cable to the WAN port of the router. 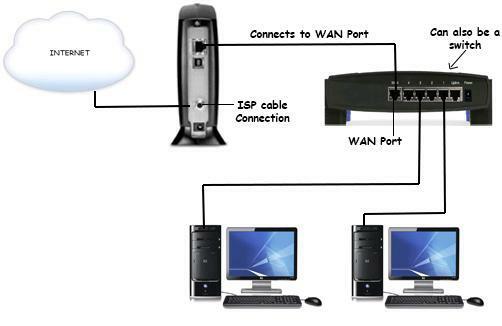 The 4 LAN ports act like a switch and you can also connect your DSL/Cable modem to one of these ports and every device connected to the LAN ports will gain access to the Internet. This means you can also use a regular switch in place of the router. This setup is actually using two routers. The Cable modem is actually a router or the default gateway. If you want to learn how to create your own Ethernet patch and crossover cabling, check out this tutorial. If you setup your home network with a DSL/Cable modem connected to a router, you will configure "bridge mode" on the router and the router will also be the DHCP server. Any computer or network device that connects to the LAN ports will grab an IP address automatically. If you decide to use a switch in place of the router, then you would configure the DSL/Cable modem with DHCP. We now need to configure the router and decide what IP address scheme we will use.